Lot occupancy regulations are intended to provide a primary control of the total volume of buildings and structures on a lot through the restriction of a building’s horizontal area above a designated horizontal plane. The lot occupancy standards applied through land use subtitles are intended to contribute, along with height regulations, to ensuring that buildings within a zone are generally consistent in their volume. Main and accessory buildings or structures are all subject to the lot occupancy standards prescribed by the specific zone in which the buildings or structures are located. 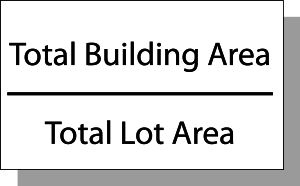 Lot occupancy is calculated by dividing the total building area of all buildings and structures by the total area of the lot.